In his early years Picasso painted birds and flowers and sweet little landscapes (truly—you can see them at the Picasso Museum in Barcelona www.musupicasso.bcn.cat),then he started frequenting Els Quatre Gats (The Four Cats), a tavern/café in Barcelona, and his painting changed. Could be the influence of other artists who made the bar a bohemian enclave of historic importance, but I don’t think so. If today’s 4 Gats is anything like the hang out of the 1890s—-and it is said to be the same both in style and substance—then I am convinced that Picasso’s ground-breaking painting style can be blamed on sangria. 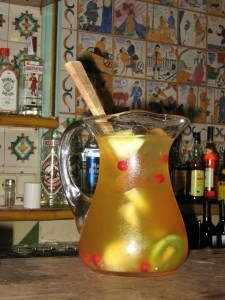 The 4 Gats sangria is as creative as the artists who make the bar famous. Based on Cava, the quintessential Spanish sparkler from Catalonia, the drink is potent enough to knock out the senses and forever change the way one looks at the world. Put 1-1/2 cups cut fruit (pineapple, kiwi, honeydew, lingonberries, etc.) in a large pitcher. Sprinkle with 3 tablespoons sugar. Add 1/4 cup Cointreau, 1/4 cup gin, 1/4 cup brandy, 1 to 2 cups orange soda pop, 1 tablespoon grenadine and 1 bottle of brut cava. Fill the pitcher with ice. Let the good times roll.